Saudi Arabia's army of migrant workers will be among the biggest losers from the slump in oil prices and the impact will reverberate to poor countries across the Middle East and South Asia where many of them originate. Saudi Arabia relies more heavily on migrant labour than any other large country except neighbouring United Arab Emirates, according to the United Nations Department of Economic and Social Affairs. The oil boom brought an unprecedented influx of migrants mostly from poorer countries in the Middle East and South and Southeast Asia. The number of migrant residents in the kingdom has almost doubled from 5.3 million in 2000 to 10.2 million in 2015 ("Trends in International Migrant Stock", UN, 2015). Saudi Arabia hosts more migrants than other country in the world other than the United States (47 million), Germany (12 million) and Russia (12 million). Migrants account for 32 percent of the resident population, up from less than 25 percent in 2000. In the case of males the share is as high as 39 percent. The share of migrants in the population and the workforce has increased despite attempts to encourage the employment of locals under official "Saudisation" policies pursued fitfully over the last four decades. In 2015, Saudi Arabia hosted 1.9 million migrants from India, 1.3 million from Indonesia, 1.1 million from Pakistan, 970,000 from Bangladesh, 730,000 from Egypt, 620,000 from Syria, and 580,000 from Yemen, according to the UN. Smaller but significant numbers of migrants came from Afghanistan (365,000), Sudan (365,000), Nepal (380,000), Myanmar (200,000), Jordan (180,000), Ethiopia (125,000) and Lebanon (115,000). In 2014, migrant workers sent home to their families an estimated $36 billion ("Saudi Arabia Article IV Consultation", IMF, 2015). Remittances from workers in Saudi Arabia play a crucial role in some of the smaller and poorer economies of the Middle East and Asia. But now that economic model is under threat from the slump in oil prices, which has pushed the government budget deep into the red and the economy close to recession. Intensified efforts at Saudisation of the workforce are a centre piece of the government's programme for adjusting to lower oil prices and creating more private sector employment. Even before the slump, the unemployment rate for Saudi nationals was 11.7 percent, according to the International Monetary Fund. But unemployment was much worse for certain demographic sections including women (33 percent) and young people aged 15-19 (49 percent), 20-24 (41 percent) and 25-29 (22 percent). Unemployment is worse in some politically important and conservative regions, such as Riyadh, Hail and the Northern Borders. "It is not that job creation has been a problem - employment growth has been strong - but rather the majority of these jobs have been filled by expatriates," the IMF observed about the economy before the slump. With growth slowing, a youthful population, and the government unable to afford to create more public sector jobs, the need to create more employment for nationals has become urgent. 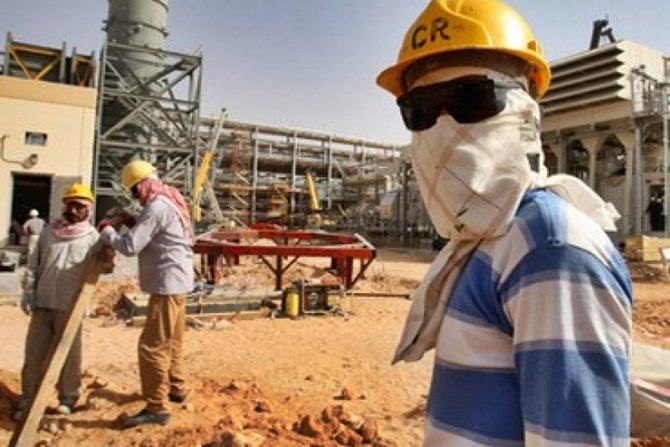 Saudisation has been stepped up which has left many migrants fearful about their continued employment and residency prospects ("In era of cheap oil, Saudi loses shine for foreign workers", Reuters, March 23). As the government seeks to maintain social and political stability and conserve cash amid a prolonged drop in oil prices and revenue, payments to migrant workers and even their jobs are the most attractive source of savings. The same pressure to reduce the number of migrants is likely to play out across the other oil-dependent economies around the Gulf. In addition to the 10.1 million migrants in Saudi Arabia, there are 8.1 million in the United Arab Emirates, 2.9 million in Kuwait, 1.8 million in Oman, 1.7 million in Qatar, and 700,000 in Bahrain. In most of these countries, migrants make up an even larger share of the local population than in Saudi Arabia, according to UN calculations. The situation in each of these economies is different. Some are more petroleum-dependent than others. Some have larger foreign reserves. And the origin of the migrants varies significantly. Western Asia, which includes the Gulf Arab countries, has the highest share of migrants in the population of any region of the world after North America. In the Gulf itself the share is much higher. In total, there are more than 25 million migrants across the Gulf, including 8 million from India, 3 million from Pakistan, 3 million from Bangladesh, 2 million from Egypt and 1.8 million from Indonesia. None of these countries is a major net oil exporter but they all seem set to suffer ripple effects from the oil shock. If remittances from the Gulf region slow, or workers are sent home, it will hit some of these poor economies particularly hard. Gulf economies absorbed a lot of young, mostly male, workers from some of the poorest countries in the world, so the implications stretch well beyond the simple economic impact to include the effects on social stability and counter-terrorism. Be prepared for the Long War!